Translated by Sr. Maria Boulding, O.S.B. 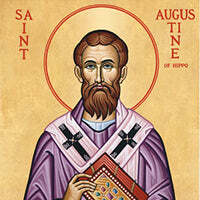 Saint Augustine was an early Christian theologian and philosopher whose writings influenced the development of Western Christianity and Western philosophy. According to his contemporary, Jerome, Augustine "established anew the ancient Faith." Augustine is recognized as a saint in the Catholic Church, the Eastern Christian Church, and the Anglican Communion and as a preeminent Doctor of the Church. This was one of the first Catholic books i bought on my road to conversion. It is powerful!